Ice-dammed lakes – developed when sub-glacial, en-glacial, supra-glacial or ice-marginal water bodies are impounded by ice. Moraine-dammed lakes – water bodies impounded by terminal and lateral moraines left behind by retreating glacier snouts. In the extratropical Andes, at least 15 ice-dammed lakes have failed since the eighteenth century (Iribarren Anacona et al., 2015), in some cases generating peak flood discharges of around 20,000 cubic meters per second (Perito Moreno Glacier GLOF in 1956 (Walder & Costa, 1996)). The release of water through or below glacier ice during outburst floods is usually controlled by threshold exceedance in the glacial hydraulic system, related to changes in ice thickness, lake bathymetry, sub-glacial water pressure, changes in meltwater production and thermal conditions, amongst other factors (Tweed & Russel, 1999; Gilbert et al., 2012; Iribarren Anacona et al., 2015). Such outburst or drainage events can occur regularly, on a near seasonal basis (e.g. Largo Arco which drained through Colonia Glacier, Northern Patagonia Icefield, between 1920 and 1958), or an irregular basis (such as the marginal lake which formed besides Juncal Sur Glacier, central Andes, and produced an outburst flood in 1954). Of recent interest, the ice marginal lake Cachet 2, which is impounded by Colonia Glacier, has drained 14 times between 2008 and 2014, releasing large volumes of water into the Rio Baker (Dussaillant et al., 2010; Friesen et al., 2015) (see Figure 1 below). Figure 1: (A) Changes in Colonia Glacier between 1985 and 2003 and sub-glacial pathway of Lake Cachet 2 outburst floods. Photographs of Lake Cachet before and after an outburst flood in A by Adrián Lillo. (B) Flood hydrographs from Baker-Colonia gauging station (45 km from the lake) showing discharges of more than three times the base flow for 8 outburst events observed between 2008 and 2012. (C) A flood warning system is operating in the Baker valley since 2009. The flood alert is declared when the level of the lake decreases six or more centimeters per hour. Figure taken from Iribarren Anacona et al. (2015). Moraine-dammed lake outburst floods are characterised by often short-lived passage of high-magnitude floodwaters which can pose a high risk to downstream populations and infrastructure (Westoby et al., 2014). This risk has increased considerably over recent decades as mountain glaciers retreat from maximum positions attained during the Little Ice Age (around 1850) facilitating the growth of meltwater lakes behind the terminal moraines left behind (Dussaillant et al., 2010; Loriaux & Casassas, 2013) (see Figure 2). The most common triggering mechanism of moraine dam GLOFs is overtopping, whereby waves produced by mass movements (e.g. snow and debris avalanches) or ice calving events breach the crest of a dam resulting in a progressive failure of the often weak moraine structure. Other triggering mechanisms include moraine collapse as a result of seismic activity, outflow channel blockage caused by ice-bergs, water displacement through the flotation of submerged dead ice, and the degradation of ice-cored moraines and permafrost as a result of atmospheric warming (Richardson and Reynolds, 2000a. ; Westoby et al., 2014). These triggering factors a summarized schematically in Figure 3. Figure 2: Retreat and thinning of Trift Glacier, Switzerland, between 1948 and 2006 resulting in the formation of a large pro-glacial lake. Figure taken from Stoffel and Huggel (2012). Figure 3: Schematic of a hazardous moraine-dammed glacial lake. Potential triggers, conditioning factors, and key ‘phases’ in a GLOF event are highlighted. Potential triggers include: (A) contact glacier calving; (B) icefall from hanging glaciers; (C) rock/ice/snow avalanches; (D) dam settlement and/or piping; (E) ice-cored moraine degradation; (F) rapid input of water from supra-, en-, or subglacial (including subaqueous) sources; (G) seismicity Conditioning factors for dam failure include (a) large lake volume; (b) low width-to-height dam ratio; (c) degradation of buried ice in the moraine structure; (d) limited dam freeboard. Key stages of a GLOF include (1) propagation of displacement or seiche waves in the lake, and/or piping through the dam; (2) breach initiation and breach formation; (3) propagation of resultant flood wave(s) down-valley. Taken from Richardson and Reynolds (2000a.) and Westoby et al. (2014). In Chile there have been 16 historically documented cases of outburst floods from moraine-dammed lakes (Irribarren Anacona et al., 2015). The largest of these outburst floods originated from Cerro Largo in Northern Patagonia. This event, occurring in March 1989, released 229,000,000 cubic meters of water into the Soler Valley and is the largest outburst flood (in terms of volume) from a moraine dammed lake observed worldwide (Clague and Evans, 2000; Iribarren Anacona et al., 2015). Such outburst events carry significant amounts of debris downstream, altering the geomorphology of river basins, and can often transport large rocks and boulders for considerable distances (see Figure 4). Some of the most deadly moraine-dammed outburst floods have occurred in the Peruvian Andes where local communities and cities exist in relative close proximity to potentially dangerous glacial lakes (Reynolds, 1992; Richardson & Reynolds, 2000a.). Since 1702, more than 22 catastrophic moraine-dammed lake outburst floods have been observed (Morales Arnao, 1999). 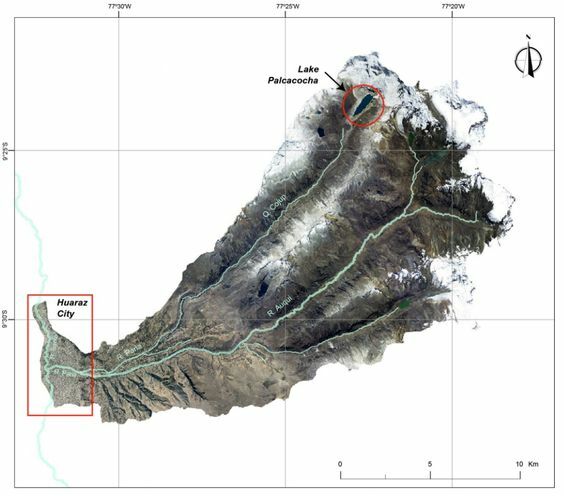 The city of Hauraz, for example, has experienced several large flood events caused by the failure of the moraine-dammed LaKE Palcacocha situated in the Cordillera Blanca mountain range (Figure 4 & 5). Of these events, the most serious occurred in 1941 when an outburst flood originating from Lake Palcacocha destroyed a third of the city and killed 5000 people (Carey, 2005). Figure 4: Large boulder transported down valley by GLOF events originating from the moraine-dammed Lake Leones, Northern Pataonia, Chile. Figure 5: Moraine-dammed Lake Palcacocha, Cordillera Blanca, Peru, pictured in 2010. Figure taken from Somos-Valenzuela (2010) (photo by Colette Simonds). Figure 6: Location of the moraine-dammed Lake Palcachocha, Cordillera Blanca, Peru, relative to the city of Huaraz. Figure taken from Horizons (2013).